Available for sale is a lot of 72 (6 cases of 12) 6.4 oz. With each of these jars the oppurtunities are endless! You can easily peel back each sticker with no residue. Each jar can either be (1) boiled so that the wax floats to the top and you can make your own candles or (2) froze as to easily chip away the remaining wax. Available for sale is a lot of 48 (4 cases of 12) 6.4 oz. 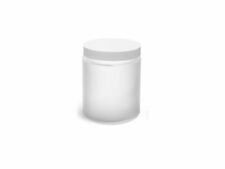 8 Frosted 8 oz Jars. White lid covers included. Neck finish - 70/400. Available for sale is a lot of 96 = (4 cases 24) of (1.5oz / 45ml) hexagon candle/jelly jars. The black plastic cap is grooved along the sides, so you can grip it tightly when closing the bottle and when opening it. Is ideal for storing herbs, spices, cooking oils, herbal extracts, and various other ingredients. 12 - 2 oz, Clear Glass Bottles, with Black Lids. The convenient size makes it perfect for travel. Perfect for travel, and conveniently fits in your purse. We stand behind our products. It says it all. Available for sale is a lot of 72 = (6 cases 12) of (3.7oz / 110ml) hexagon candle/jelly jars. 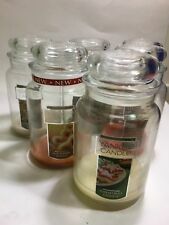 Glass Candle Making Jars, 2-16oz 2-4oz. Condition is Used. Shipped with USPS Parcel Select Ground. CRI5558 CRISA BY LIBBEY GLASS VOTIVE HOLDER SQTAPERED 3 8. Model Number: CRI5558. Manufacturer Part Number CRI5558. Product Model CRI5558. Manufacturer: CRISA BY LIBBY GLASS INC. Manufacturer CRISA BY LIBBY GLASS INC. These high quality, cobalt blue, glass, round jars are perfect for use with lotions, creams, and scrubs. Inner liners create a tight seal. Perfect for travel, and conveniently fits in your purse. The inventory is updated and monitored regularly. Manufacturer: Premium Vials. Label: Premium Vials. Publisher: Premium Vials. Studio: Premium Vials. PET plastic can be impact resistant, therefore a good alternative to glass. These jars are wonderful when used in the kitchen and pantry for spice jars, dried herbs, nuts, teas and coffee. Available for sale is a lot of 120 (4oz / 118ml) "straight side" candle jars. Available for sale is a lot of 144 = (6 cases 24) of (1.5oz / 45ml) hexagon candle/jelly jars. LABORATORY TESTED AND APPROVED, ULTRAVIOLET GLASS: Preserve and rejuvenate freshness of plant-based goods, for over 6 months! Blocks out all damaging visible light rays and only permit beneficial rays to enter. New glass candle making jar! Round top, square jar. Does not include lid. These jars are new and have never been used. Great for making decorative/unique candles. Available for sale is a lot of 312 = (13 cases of 24) of (1.5oz / 45ml) hexagon candle/jelly jars. Available for sale is a lot of 120 (10 cases of 12) 9 oz hexagon candle/jelly jars. Available for sale is a lot of 360 = (15 cases of 24) of (1.5oz / 45ml) hexagon candle/jelly jars. Available for sale is a case of 48 (1.5oz / 45ml) hexagon candle/jelly jars. Set of 12 Glass Hexagon 9oz Glass Jar for Candles with Wick and Round Lids. In Unused Condition!!! Please Email Questions!!! Thank You For Looking!!! 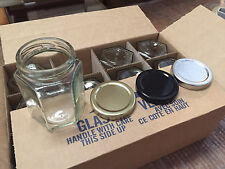 Small glass containers with metal lids. Cool for small items. Trending at $16.95eBay determines this price through a machine learned model of the product's sale prices within the last 90 days. 1oz Boston round clear glass. 1oz or 30ml size clear boston round glass bottle, 288 pc in the case and black top. Oh my goodness the amount of uses for these are endless. Unicorn Glitter LLC brings you GoJars: A perfect vessel to create unique and fun gifts for all occasions. Airtight and watertight seal makes certain that food won't spoil. Easily seal lids with minimal effort just like a pickle jar. Size : 50G. Quantity: 1pcs. material: Glass. Easy to carry in your purse.